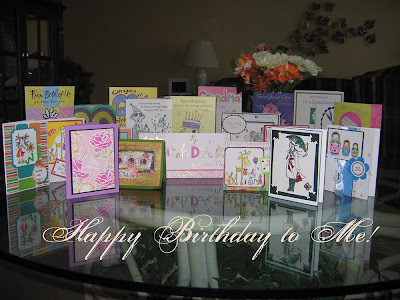 A lovely display of the many, many cards I received from my Shackie friends and my family. That's right, today I am 60 years young! In print, it looks really old, but in reality, it's just perfect. There was a terrific party on Sunday afternoon attended by family and friends. It was a fantastic day. And, the gifts were great, although entirely unexpected. 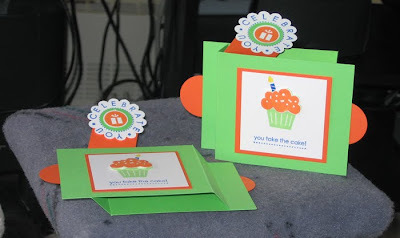 There were several gift cards to different spots like Pier1 Imports, Wal-Mart, The Scrapping Turtle; there was a pair of silver earrings; there were flowers; there was even a cake that had a stampers/scrappers theme. Here's a picture of half the cake because my DD, Tiffany, has the better pictures on her camera and I don't have copies of those. Can you see the scissors, the glue stick and the roll of ribbon? All made out of fondant icing, if you please!! And, of course, there were three mats, of which only the "Birthday" one is left in this photo, and they look like card fronts to me! Too cute for words. The only thing that could have made the day more perfect would have been the addition of my daughter, Kirsten and her family to be here, but as you know, they live in London, England. I did dream that they were going to be here as a surprise, but it was just a dream! If Tiffany and John (DH) have read this far, they're probably wondering when I'm going to get around to telling you what their gift was. Are you ready, really ready? I'm going to Las Vegas for three nights and four days at the New York, New York Hotel & Casino with my daughter, Tiffany! Thanks, Tiff. While there, John has given us tickets to see "The Divine Miss M", aka Bette Midler, at the Colosseum in Caesar's Palace! OMG, I'm jumping out of my skin. So, that's my post for today. I've got to get ready to go out with my son, Phil, and the grandkids. Those gift cards are burning a hole in my purse! See you later. Get Sketchy Challenge # 1 - YAY! I gather from reading Bree's entries in the Get Sketchy blog that it has been a long road to the inaugural sketch. Well, I'm happy because sketch challenges are really good for me and make me happy. Here is my entry for GS Sketch #1. 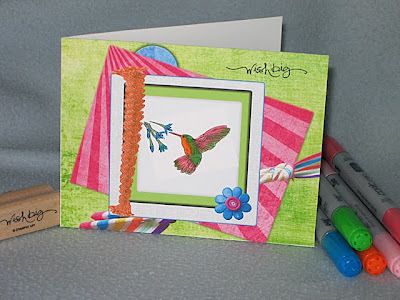 This card follows the sketch sample, but is different in that it was done completely digitally, except for the colouring of the image and the sentiment stamp. I don't know if that is allowed or not as I believe in going ahead and just doing it. Anyway, it's always easier to ask for forgiveness than permission. So, Bree, if it's ineligible, that's okay, I still enjoyed myself while making this card. Now for the credits. While drinking my morning coffee, I was watching the program "Hidden Potential" on HGTV (my most-watched channel). They were doing make-overs to an old house and totally changed the front facade. 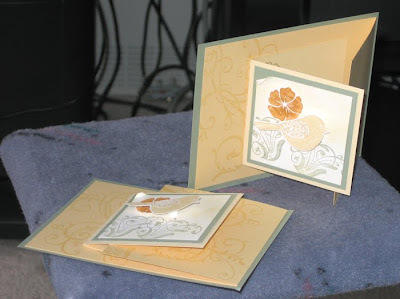 I looked at it and thought, "Mmmm....there's a great design for a card there", and promptly went into my craft room. I always check out Google Reader for the latest entries in the blogs I follow and up came Color Throwdown #56. Loved the colours and knew just what I wanted to do with these colours, and I was fortunate enough to have the SU cardstock, too. I didn't have an appropriate stamp for a house, so I went to The Quote Garden to find a suitable verse. So, now that you've got the background on how this card came to be....here it is. Thanks for stopping by, please come back again. 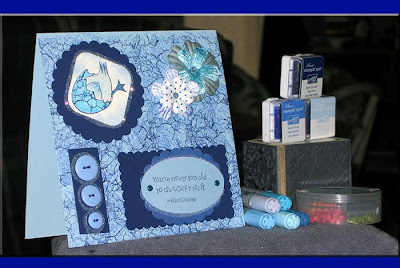 My stamping buddy, Jennifer, decided upon a monochromatic colour scheme for this week's challenge at The Stamp Shack. Great challenge, Jennifer, thanks. I just love the marble-style cube by Stampendous that is three-sided. It makes for a great background when that perfect patterned paper eludes you. It can be any colour of ink you have; it doesn't have to be monochromatic, you can mix it up, especially for the Autumn season soon to be here. These are two of the four cards we made at my demo's house on Tuesday night. Donna is really cool and doesn't get flustered with everybody asking her questions. YAY! Donna. The class was called "Cards that WOW!" and they did just that. I tried out the Big Shot machine for the first time and was totally surprised at how easy it was to use and the handle turns so smoothly. The green and orange card was a little more difficult. Scoring the cards, then making the little pop-up thingy to put inside, and, OMG, where to place it so it would pop-up properly. Well, I hated maths in school and discovered I still dislike maths, but love the card. I may have to try this in the privacy of my own home where curse words will fall on deaf ears! 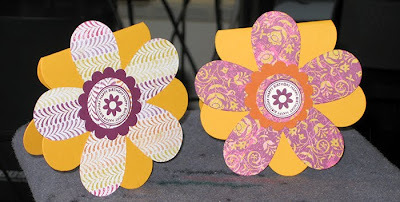 As you can see, the little flower cards are just adorable and so easy to make with the Big Shot. Here are the next two cards. The Barely Banana & Sage Shadow is a truly elegant card. I think I'm going to use this for my Christmas cards this year. I just love it. The triangular, stand-up card is also pretty cool. One of the other ladies suggested it could easily used as a little container to hold Christmas candies or little chocolates. I may see if my DIL would like them as treat-bags for Ava's (DGD's) 1st birthday in November! Well that does it for my most recent cards. 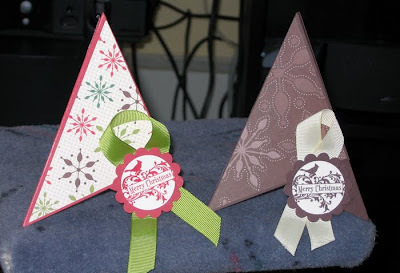 Go check out Stampin' & Scrappin' with Donna for more ideas. Do you like my new blog header? I have been playing around in PhotoShop CS3 and made this. 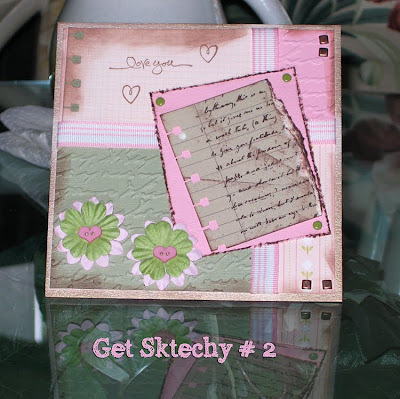 A new SKETCH CHALLENGE blog is on the scene! How many times have you heard me say I love sketch challenges. They are my saving-grace when my own creativity deserts me. Well, there's a 'new kid in town'. 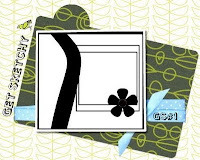 Go check out "GET SKETCHY" and maybe even win some fabulous blog candy into the bargain! Okay, that's it. Don't waste any more time here. Go check out the newest blog on the block! Go, now, click on the link......but, please, come back again to see me, too. 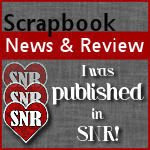 I was doing what I love to do yesterday which is surfing the 'net for new digital scrapbooking sites. I found Heritage Scrap and finally knew what I wanted to do with my Mom's photos which were loaned to me when she passed on in 2002. It was to be my task to scan all the family photos and then make CDs for my siblings and any of the grandchildren who wished to have them. Well, it's been years now and I now know what I want to do with them. I've enlisted the help of GramperStamper (DH), who is going to do the scanning and then I will put most of them onto quick pages, but for some very special photos, I will make dedicated pages. 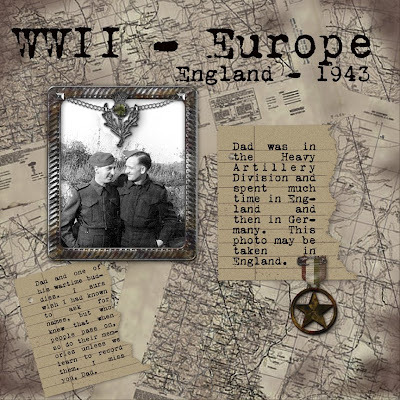 I have already scanned some of the photos which my Dad sent to my Mom during WWII. Here is my first page with a vintage feel to it. 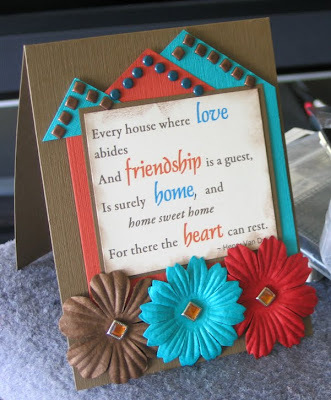 All of the elements used to make this page are by Roberta T. Designs, available at Heritage Scrap. BasicGrey Blog has fab blog candy! This wonderful blog candy is open world-wide so go on over and check it out at BasicGrey Challenges. Hurry, don't wait, that's why this post is short. ....The Stamp Shack. Weekly challenges have been re-introduced by some of the members and this is my card for Theme Challenge 14. 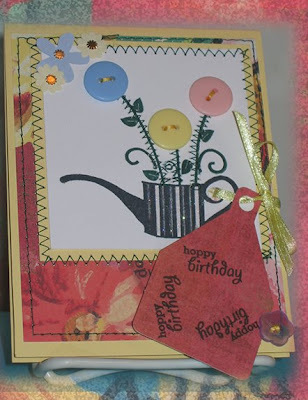 The requirements of this challenge were to use stitching and buttons on a card. 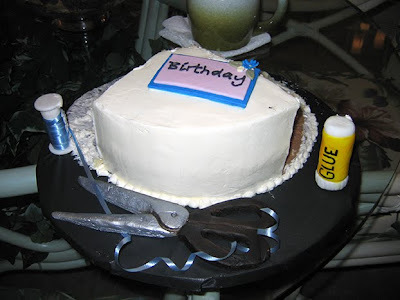 Pefert, says I, my SIL is having a birthday this week and she is a marvellous seamstress so I made it for Jeanne. Naturally, after creating the card, I needed to photograph it and then post it. With all that I've learned through the digital scrapbooking courses lately, I felt that my card photos are lacking a little something, but, I could change that, so I did. I took a piece of the DP is used on the card and just photographed it all by itself. Then I used that as a background to the card. I used a filter on it so that it would soften it up. 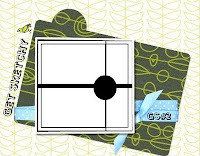 I photographed the card separately and brought it onto the the background and used a 25 pixel crop to feather the card into the background. I plan to use this method regularly as I think it makes a much more please photo to post.